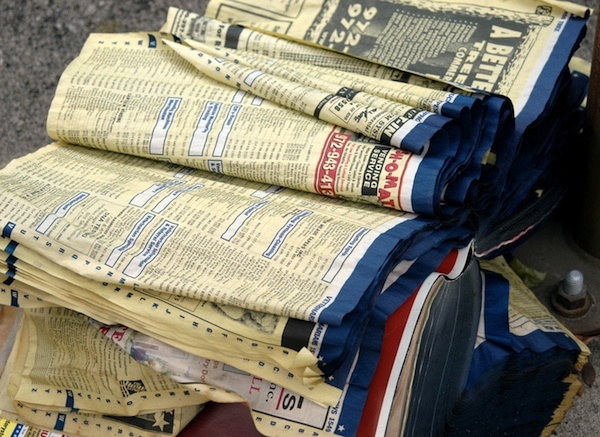 The Yellow Pages and the hard copy phone book are no longer relevant. Neither is TV Guide. What does relevancy mean? How did these (and countless other businesses) lose theirs? Some enterprises never quite reach a high state of relevancy. That is, they’re never very valuable. If you live in a suburban area like I do, just look at the strip centers (shopping centers) in your area. They likely have one or two businesses that are pretty constant. Maybe a restaurant or grocery store. But most of the store fronts are likely occupied with smaller, locally owned businesses. There’s the dry cleaner, the donut shop, the nail salon, the locally owned sandwich shop and so on. Some of these businesses last for a few years, but many of them come and go because they simply couldn’t gain traction. They never established enough value to build a customer base…so they died. Falling into the abyss of irrelevancy. Some enterprises can’t adjust when disruptions come. The manufacturers of horse drawn buggies don’t exist any more. They went from prominence to irrelevance when the automobile arrived and gained widespread acceptance. But an enterprise loses relevance before it reaches extinction. Xanga was once a social media rockstar. Not today. Groupon was the fastest growing company. Today they’re on the fast track toward becoming irrelevant. So it goes when leaders don’t maintain the vigilance to stay relevant. 1. You must have a market. Ideally, marketing experts will tell you that you need “a hungry market.” Markets can vary wildly from mild to famished. It’s all gauged by sales success. No sales, no relevancy. To be fair, a sale doesn’t have to be an exchange of products or services for money. It can be patronage, support or some other variation of an exchange in value. For example, acts of philanthropy happen for many reasons. A person may have a personal connection to a specific non-profit. A person may want to contribute to a specific enterprise expecting nothing in return other than knowing they’re supporting a cause they believe in. Maybe a person simply needs a bit more of a tax deduction. Businesses, non-profits, researchers, governments and all other organizations need supporters. Getting those supporters is what I mean when I say, “Making the sale.” That’s the only way of getting a market. You must make a sale. The more sales you make, the more relevant you are. 2. You must hold onto a market. You’ve got get repeat business, or have ongoing support. Retailers know they’ll experience a degree of customer attrition. A certain percentage of their customers will move away. Another percentage may die. Still others will find a more suitable solution based on price, selection, quality, convenience or a host of other reasons. Great retailers work hard to eliminate losing customers by continuing to elevate their performance and offerings. You’ve got to hang onto your current supporters. It’s not enough to get them once. You need to keep them faithful. 3. You must grow your market. Because retaining supporters isn’t a perfectly achieved objectives (how can a retailer prevent customers from dying? ), you’re going to have to bring in new supporters to replace those who go away. You also need to grow your enterprise. You can grow your enterprise by increasing the number of supporters, by increasing the level of support you’re getting from current supporters or by doing both of those things. The last one is the best strategy! How can you achieve relevancy for your enterprise? That’s the real issue today. And our headline provides the answer. Three of them actually…but you need all three if you’re going to sustain relevancy. You can’t establish relevancy without people. You need people to help you provide it. You need people who appreciate it enough to support it. You even need people willing to partner with you along the way. Undervalue people and you’ll undermine your ability to achieve relevance. Make false assumptions about people and you’ll lose. Many enterprises assumed people wanted something only to find out too late, nobody wanted it. Enterprises often assume they can grind through people (employees, volunteers or other internal people) and it won’t impact their progress in the market…until people reach the point where they won’t take it any more. Citizens revolt against oppressive governments. Workers rebel against tyrannical employers. Patrons abandon the poorly run charity. People matter. Don’t forget it. Just because yesterday’s performance gained you a market doesn’t mean the market will stick with you if you let your performance slip. You can’t assume that what got you here will get you there. Markets are constantly changing. That includes yours. Keep pushing your performance to serve your market better. Listen to your market. Pay close attention to what they buy, what they want and what they hate. It reminds me of a guy I heard about who was doing some coaching for a mid-sized organization. Every month he’d come in and deliver a presentation that was open to all the employees. He’d hold forth like most gurus do. At first, the room would be packed. After awhile, the room began to have some empty chairs. This went on month after month until the room was more empty than full. Eventually, the organization felt they’d received all the value they were ever going to get from him so they parted ways. I wondered what he must have been thinking as he saw the attendance dwindle month after month. Why didn’t he ask the organization what they needed or wanted? Why didn’t he adjust some things? Maybe his content, maybe his approach, or something else that may have helped him engage the employees more? I don’t know why he didn’t. Any more than I know why a person holds onto a broken business model. But I’ve seen it happen frequently. People let performance erode because they don’t see it even though it seems to be staring them squarely in the face. High performance demands high awareness. It demands humility. Be ready to ask, “What can I do better? What can I do differently that will be more valuable to you?” Then get busy doing it. You’ve got to stay ahead of the curve of customer satisfaction by aiming for customer delight – customer happiness! Another part of performance is leading and managing. Leading involves people. Managing involves the process, or the work. And since people do the work, you’ve got to hold people accountable by demanding their very best. Sure, there’s proper selection (hiring), training and support. Support should be ongoing for all your people. You’ve can’t support them if you refuse to hold them responsible for the outcome. And the outcome is always going to be the result of the process. That means you’ve got to give the proper time and attention to systems, work flows and the documentation on how things must be done so you can deliver predictable success every single time! I put purpose third, but it really belongs first. I did that because I wanted to end with it and have that be our final thought. So many times I see people who neglect this component of being and staying relevant. Simon Sinek calls it “your why.” In fact, his book title tells you the importance of it, Start With Why. Fail to start with why (or your purpose) and it’ll be tougher to find your way through the maze of organizational or business challenges. If you know your why, then you’ll make decisions that are congruent with that purpose. Without a purpose you may wind up chasing your tail. “My purpose is to make as much money as I can,” he says. “How is that going to help you establish, much less maintain relevancy?” I ask. “I’m going to find a way to get people to buy,” he replies. “So your purpose is to GET people to buy?” I ask. That’s a poor purpose. It’s manipulative. It’s mercenary. When push comes to shove, this person will likely do whatever is necessary to make a buck. Contrast that with another conversation. Is that a world changing purpose? Well, it is for the people he teaches. Yes. Will that purpose direct whatever actions he takes in his guitar instruction business? Absolutely. You need a purpose that will provide you that kind of clarity. The guitar instructor will be able to build and maintain relevancy because he knows exactly why he’s doing what he’s doing and he knows exactly what outcome he wants for his students. Every guitar student wants to be able to play confidently in front of their friends. Some want more, but if you can’t accomplish that goal then you can’t advance beyond it. This guitar instructor knows that. And for the advanced student who wants to go beyond the stated purpose, the purpose still helps keep things on track. Fundamentally, it’s all about the thrill of playing confidently in front of people. For some of his students it’s a guy who wants to play a song for his girlfriend (an audience of one). For another, it may be a guy who wants to play with his band in front of thousands. The purpose holds.